Sign up below now and, as a thank-you, you will receive a copy of the BHV Duct and Fitting Guide. This guide contains twenty pages, and is full of valuable information, charts, diagrams, and other material to help you get your next order going quickly and accurately. Get yours now. As our current customers have already learned, BHV Sheet Metal Fabricators represents not only the highest level of quality and service, but over sixty years of experience in the industry as well. Discover the BHV Advantage, and you can expect your jobs to go more smoothly and be more cost effective. With BHV, there is no guesswork regarding the engineering requirements of your job because our experience and know-how in the design and fabrication of HVAC and industrial duct and fittings is second to none. At BHV we provide support to our customers and work closely with them on each order to insure a successful job each and every time. 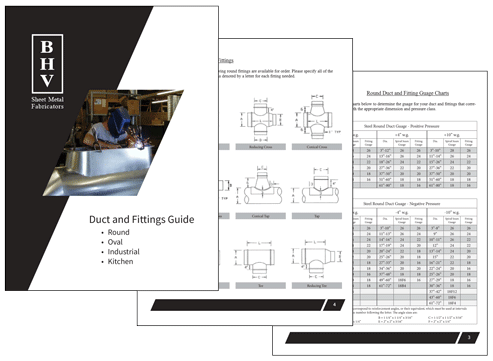 Subscribe to receive your copy of the BHV Duct and Fitting now via email.